I never finished my communications degree. I never really cared that I didn’t get that double major until I dreamed up this nook in my head and then tried to explain it to contractors and cabinet makers. Thank God for Tim and the years he has spent learning to speak and translate Meg’s Big Ideas because without him and the help of Google SketchUp, I don’t think this kitchen would ever get built. Here are my plans for the Kitchen Nook or Banquette as Tim translated them from fuzzy words, estimated measurements and bad sketches into Sketchup with precise measurements. So where are we with the renovations? We have hired a contractor and put a large down payment towards the reno. We have met with countless cabinetry people and chose a local guy with a shop in his backyard that does amazing work and is fairly priced (Go Local!). We have bought kitchen appliances and they will be delivered in March. We have begun the long process of cleaning out rooms and making donate, garbage and store-in-garage-until-after-reno piles. Last night Tim and I sealed off the play room and scraped the popcorn off the ceiling. We opted to DIY wherever we could to save us money so we could pocket the cash for predictable “unforeseen costs” that we have been warned will arise with any renovations of this size. So we scrapped the ceilings to save a few hundred dollars so when plumbers need to move a water line or contractor needs to rewire something, we are prepared. Plus… I love DIYing and seeing Tim in a face mask makes me smile. Follow me on Instagram for live updates on all things reno and kids. I did it all by myself because I am crazy, stubborn and awesome. Tim wasn’t on board with this project. He is logical and didn’t see the purpose of taking down the popcorn when the only problem with it was that I didn’t like the way it looked. Here are some truths about Tim and my marriage. Tim helps around the house (a lot) even though he works 60 plus hours a week outside of the home. Tim will help with whatever I ask him to help with because he is a hard worker and he loves me. I spent years honing my manipulation skills on my little sister. I could totally take advantage of Tim, but I love him and I won’t do that. Not that I don’t love you Beth but Tim and I share a bedroom. We never had to share a bedroom. It is never a good idea to piss off someone you share a room with, just ask my college roommates. The second reason I didn’t ask Tim for help on this one is that I know someday (in the very near future) there will be a project I want done and I will need his help. SO… this project I did all on my own. I did it to bank some Honey Do points that I plan on cashing in on… Oh I don’t know… maybe an entry way makeover?! So this is how I did the de-popcorning. I put Elise down for a nap. I covered the room in plastic. Elise woke up from her nap. Elise and I picked up Patrick from school and I sat them in front of the TV with a snack. I filled my squirt bottle with water and then proceeded to squirt, wait a few minutes and then scrape. I did this 2 square feet at a time for as long as I could get away with it. *TIP* wear socks so when you leave the room you can take them off and not have to worry about tracking the muck all over the place. It took a total of 2 naps and snack movie times to get it all scrapped. The “popcorn” came off pretty easy once it was wet. I held the scraper at an approx. 20 degree angle and just kept scrapping. It was messy, wet, pasty and I can’t believe that people put this stuff on ceilings. Gross. After the ceiling dried completely (the drywall was never wet wet, just damp) I had to mud all the nicks and dings in the ceiling which happened during another nap/snack time. The mudding dried for 24 hours and then I sanded during another nap. I wrapped a piece of high grit sandpaper around a 2×4 to make the processes easier. The scrapping was messy but nothing compared to the sanding. The sanding was horrible. I wore a mask and my glasses. Every 5 minutes I would have to take off my glasses and clean them because the film was so thick on my lenses that I couldn’t see. I kept the window open but it still was awful. When the sanding was done I cleaned all the mess up, vacuumed for the 100th time during this project and then wiped the ceiling with a damp cloth. When Tim came home that night I put up a coat of primer. By then it was weekend and the next morning I was able to put up a coat of paint. Beth came down for the weekend to visit. She played with the kids while Tim and I prepped the room for staining. 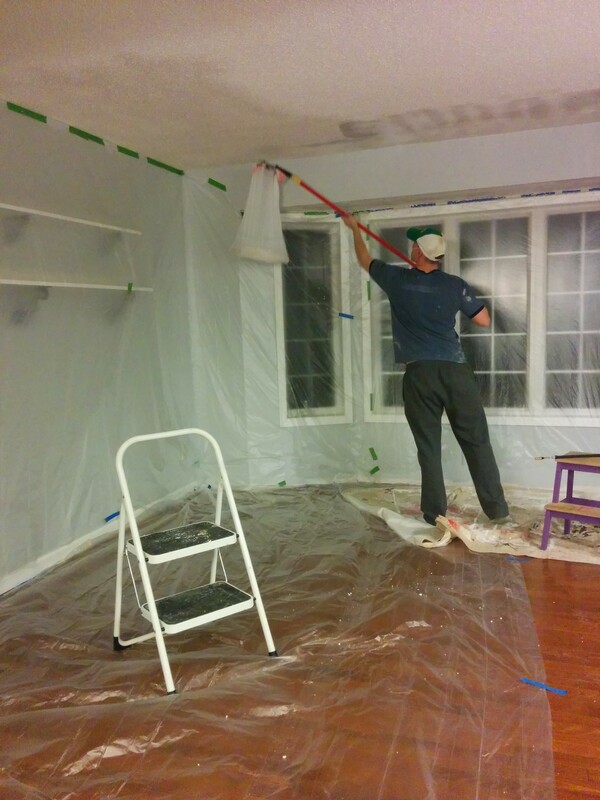 By that evening Tim and I were staining the lofts. Could this have gone faster with help? Absolutely. It would have been way faster if I could have worked outside of the nap and snack window of time but it doesn’t matter. It is done now. I got a fantastic arm work out in the process and best of all, I saved all my Honey Do points for another project. Verdict? The room looks great. The boys loved that the “pricklies are gone!” Even Tim said it looked good. Will I do every room in the house? I don’t know. I know I would tackle all the bedrooms DIY style but before tackling big areas like the open floor plan of the main floor I would price out what a pro would charge because sometimes paying a pro is worth the price tag just to keep your free time free (Tim taught me that). more pics of the process here.